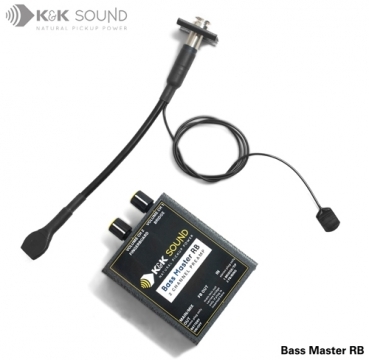 The Bass Master Rockabilly is the first upright bass transducer system designed specifically for Rockabilly and slap bass. It combines two transducers (the Bass Max and a fingerboard pickup) to create an integrated double bass pickup system that brings out the percussive and subtle fingerboard sounds, as well as strong and warm bass tones. Each Bass Master Rockabilly can be fine-tuned via the separate bass and treble controls within the two-channel preamp, providing an infinite range of combinations for every player and any style of play. The first component, the popular Bass Max, is positioned in the bridge wing. To make the Bass Max, we combine two transducers into a "sandwich" in order to maximize and enhance vibrations captured from the entire bridge. Only one Bass Max is necessary to provide an even signal from all four (or five) strings. Its strong midrange signal is ideal for cutting through the mix in loud Rockabilly situations, or providing a warm and supportive line for country bluegrass. The fingerboard transducer's unique size and shape allows it to be precisely placed on your instrument. The preamp lets the player blend in just the right amount of slap, growl, and other fingerboard sounds to reach their audience. This allows the player to achieve the exact sound they desire. The two-channel preamp has internal gain, bass, and treble trim pots for each pickup, allowing impressive +/- 20dB tonal adjustments. External volume controls let you balance the volumes of the bridge and fingerboard transducers on the fly. A convenient belt clip is included with this compact preamp, which weighs a mere ten ounces with the battery installed. A six foot, high quality three conductor (1/4 inch stereo) cable is included to complete the package. Input: Stereo 1/4" | Output: Mono 1/4"